I've been a software engineer for quite a while now. How long, you ask? Let's just say that the waterfall model was state of the art when I was studying* for my CS degree. Actually, despite it being the title on my business card, I've always been reluctant to refer to myself as an engineer; writing code has always seemed to me more of a creative process, than one of precision as would befit the title "engineer". Code is constrained more by the experience and imagination of its creator, than by such practical considerations as capacitance and resistance that are the realm of an electrical engineer, to whom the title of engineer seems far more apropos. But that isn't to say that the work days of we code monkeys are entirely devoid of process. I think it is terribly important to learn from the mistakes we've made in the past. We've learned that customers could not reasonably be expected to completely understand up front what it is they wanted a computer program to do; and so, the rather rigid waterfall model fell by the way side. In its stead we now see predominately iterative models, with Agile seemingly leading the charge these days. This is all good progress, barring the odd self-indulgent wallowing in buzzwords that we've seen along the way. Still, I'm not much of one for blind faith when it comes to software development models or design practices; I don't particularly try and follow any given formal method of decomposition during design, or care whether a particular refactoring I just did has a cool name. So what do I do? So what the heck is The Way of the Brew Peg? Well, at work we have a large coffee pot. It is filled often, as you might imagine, but there's a problem: it's very hard to tell, without stooping down and peering between the filter cup and the pot, whether the coffee is still brewing. Hence, there have been many cases of still-pouring coffee making its way onto the counter and floor as one poor caffeine-seeking soul pulls the pot out prematurely. Sure, an upgrade to a fancier coffee pot might have done the trick: had a glaring brew-indicator lamp, or a locking mechanism of some form. And we even have one of the most imposing looking coffee-in-a-teabag-thingies too. But you know what works great? A plain wooden clothes peg clipped to the handle of the pot. When your sleep-addled brain tells your hand to pick up the pot, your hand spots the impediment in its path and quickly relays caution back to the brain. Those two small pieces of wood held together with a spring have saved you from embarrassment, a potential scalding and some floor cleaning. 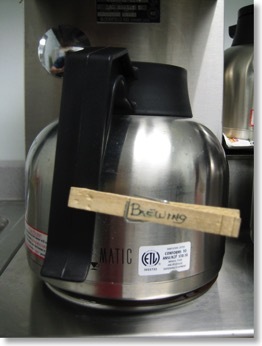 So when you're writing that next design document, or defining that API, remember the brew peg. It may not have the pizzazz of a YAGNI or a KISS, but will they keep you from burning your hand?